Temple Beth Or welcomes visitors. Every service for Shabbat, holidays and festivals is open without charge to anyone who would like to worship with us. The notion of setting aside every seventh day as a day of rest was an idea of great genius among the early Hebrews. Other societies in the ancient Near East apparently regarded the phases of the moon to be days of superstition and dread – days to avoid going out of the house or engaging in work. The Hebrews turned a day of fear into a day celebrating God’s creation, a day to rest from work and become closer to God. Shabbat – the word means “He rested,” in Hebrew – is one of Judaism’s most ancient holidays, and was regarded by the early rabbis as its most important – even more so than Rosh Hashanah and Yom Kippur. At Temple Beth Or, Shabbat services are held every Friday evening throughout the year, usually at 6:00 p.m.
Our Temple has been using Reform prayer bookssince the 1870’S. We have used all editions of the Union Prayer Book,and its successor Gates of Prayer, published in 1975. Our current prayer book is Mishkan T’filah, which has been the standard Siddur of Reform Judaism since its introduction in 2007. Music for most Friday evening services is provided by a professional choir, led by Rebecca Taylor, who also accompanies on a traditional organ. They also accompany services for the High Holy Days. Services throughout the year also feature soloists accompanied by guitar or electronic keyboard to provide a more contemporary feel for our worship. Shabbat services almost invariably include a sermon. 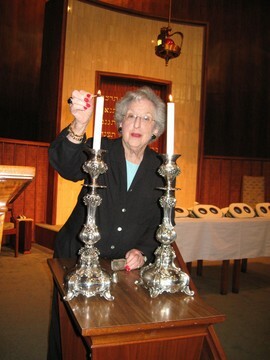 Shabbat services are the high point of a congregational week at Temple Beth Or. Baby namings, anniversary and birthday blessings and occasional receptions and guest speakers have added a wonderful atmosphere of joy and sanctity to our community. Check the congregational Calendar for more details about timing and special events.